The Jason Gisser Band formed in the late summer of 2015. After recording their first album, “In The Garden of Crows,” they went on to perform at large venues throughout the region. Opening for bands such as Hoobastank, Grand Funk Railroad, Three Dog Night, Lukas Nelson and The Promise of the Real and many more, The Jason Gisser Band began headlining large venues; and with quite a few sold-out shows, they began playing festivals. 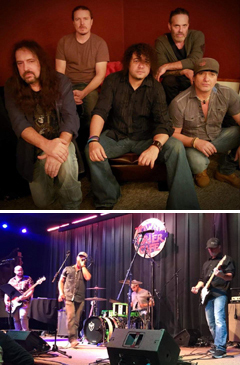 In 2018 The Jason Gisser Band received a high honor as their song “The River” made it to No. 2 on the Song of the Year charts in Ark of Music. After a few lineup changes, The Jason Gisser Band is working on their second album, which should be done by the fall of 2019. The band consists of Jason Gisser (acoustic guitar & vocals), Jim Verzi (bass), Stephen Habo (drums), Doriano Magliano (lead guitar, backing vocals) and Geordie Mac (keys, backing vocals). A decadent combination of rock and blues punctuated with modern influences, The Playback resonates the Hudson Valley with original bliss. A grouping of strengths joined in the name of audible excellence, The Playback is Travis Schifko on vocals, J. Michael Prizzi on guitar, Randall Federighi Jr. on bass and Kyle Buckley on drums. Their latest release, “Prophets and Thieves,” was recorded at Millbrook Sound Studios and is available on iTunes, Google music and Spotify. The Playback puts on a stellar, high energy live performance that no one should miss.